PEST CONTROL VICTORIA - GREATER LONDON - RATS - MICE - BED BUGS - FLEAS - PIGEONS - GULLS - FLIES - ANTS? Pestforce Victoria is rated 4.8 out of 5 based on 5 customer reviews. I’m Sean Banks and I am the owner and Senior Technician and have a close knit team of highly skilled Pest Controllers at Pestforce Victoria. If you have a pest problem – or think you may have a pest problem – then call me or a member of my team and get not only one of the best pest control services in the area, but great advice too! We are local to you and can be with you same day when necessary. We have recently gained the rare feat of a Distinction in my BPCA/RSPH Level 2 making us one of the best qualifed Pest Controllers around. We service all W & SW postcode areas including the Victoria London. A pest is often defined as ‘a plant or animal that is detrimental to humans or our concerns, such as crops and livestock’. Pests can also cause nuisance and carry disease. All animals, birds, rodents and insects can become a pest when they become invasive, detrimental, troublesome and destructive or a nuisance. Many people use the term pest alongside the term vermin. In some cases, some of these animals can be beneficial – for example, as part of the food chain – but in other situations and settings, they can be a nuisance, therefore a pest. Rats – a massive problems in all areas, not just the Victoria. The way we live, the rubbish that is a welcome food source to rats, all contribute to their numbers swelling. Prolific breeders, their numbers can swell within weeks! But, as well as being a nuisance they also carry a bacteria that when humans come into contact with it, can make us very ill.
Pigeons – they can cause a huge amount of damage to buildings when the roost and nest. Rather than having expensive repair bills on a regular basis, why not invest in bird proofing equipment instead? These methods effectively and humanely stop birds from roosting on buildings. Insect infestations – more common than you think, many people find that they homes are under attack from small, tiny, almost-too-small-to-see insects! These pesky little creatures find their way into our homes in a variety of ways – on our pets, our clothes, bags or simply blown in through an open window. Either way, our warm, well-insulated homes provide a perfect place for them to multiply and live. Call Sean or Mark today you local Emergency Pest Control in West & South West London on 07500 443535 for advice, request a rapid response callout or to see how we can best help you. Can I deal with a pest problem myself? If caught early enough, some shop bought remedies and deep cleaning can be effective but all too often, we do not realise there is a problem until the problem has become sufficiently ingrained so that we notice, for example, seeing a rat during the day, notice fleas on the soft furnishing or waking up in the morning with a row of bites on us, indicating we may be sharing our bed with bedbugs. If you have a rat problem, if no-one else can help, and if you can find them (google), you should definitely call PestForce. My basement flat was overrun with sewer rats and my family were terrified. Sean came round instantly (even though it was almost midnight), laid lots of traps, and when a rat was sighted even started hunting it with an air rifle. Sean caught all the rats, solved the problem, and gave us a discount on the final visit. He’s a lethal pest controller and a true gentleman, and I would recommend his services to anyone! Think you have a pest problem or issue? Need help? Call me for a quick, responsive pest control service. Set bait for pests/ helped pest proof home. Original review left on Checkatrade, click here to view! 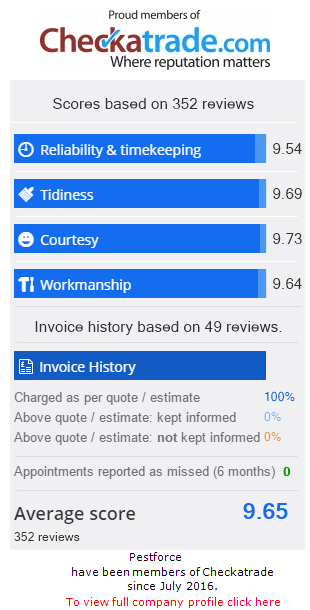 See this review on Checkatrade! Went beyond the call of duty, really grateful for work done.